As Royal Navy whistleblower William McNeilly remains in military custody for criticizing Trident nuclear safety procedures, an ex-Navy sailor who backs many of his allegations has spoken at length to RT. Euan Bryson, 25, served in Britain’s Royal Navy for 4 1/2 years as a communications and IT specialist. Among his leading roles were positions onboard the UK’s ex-Royal Navy flagships HMS Ark Royal and HMS illustrious. 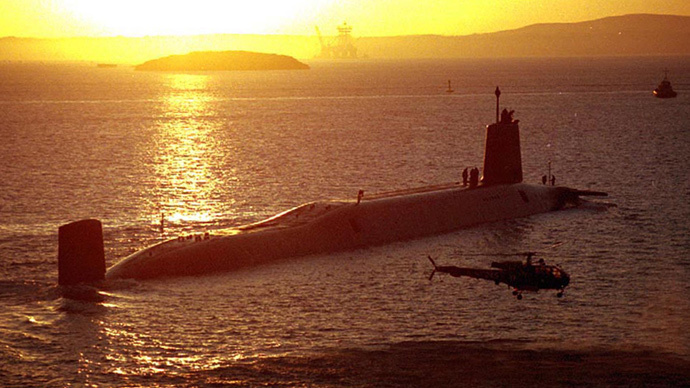 The former sailor also served at the Faslane nuclear submarine base where McNeilly was working before publishing his 18-page report, which argued that the Trident nuclear program posed serious safety and security risks to Britain. Bryson told RT on Wednesday he was disturbed by how the issue is being covered by UK mainstream media outlets – a number of which approached him after he commented on the Trident scandal in the Guardian on Tuesday. He said despite various invitations he was “uncomfortable” at the thought of speaking to them after observing the tone of much of the commentary on the case. Bryson, who says he is a concerned ex-serviceman and not a whistleblower, slammed media commentators’ attempts to undermine McNeilly’s credibility in recent days. He said questioning McNeilly’s mental health was just “an easy default” used against people who speak out, and insisted he believes the Trident whistleblower had joined the naval force "to serve the public” like himself. Bryson felt McNeilly’s actions were too coherent for him to be written off as mentally ill. “He was willing to risk it all, you don’t do that on a whim: that is a calculated risk,” he said. @METAKNlGHT TBF, they've contacted me and want to chat tomorrow. However, I'm concerned about talking to them after seeing that. The former sailor said that even if it was true that NcNeilly had mental health issues, it was just another example of the Navy’s lamentable security and safety standards. Bryson recalled he had seen drunken service personnel in civilian dress let into secure facilities while at the naval base in Portsmouth, England. They had secured entry by flashing bank cards at inattentive sentries from across a road, he said. He added during his entire time serving the Royal Navy, he was rarely searched when entering a British naval base. He conceded, however, that he was occasionally searched when returning from deployments around the world in case he was trying to smuggle in cartons of cigarettes. “This is a bigger issue than just an occasional security lapse. There is an attitude problem in the military in general. They just don’t think it will happen to them,” he said. The 2013 murder of British soldier Lee Rigby by jihadists in Woolwich, London, was interpreted by many as a glaring “security lapse.” Referencing the murder, Bryson said many have failed to accept that the War on Terror has come to Britain’s doorstep. The MoD has announced that they will not charge McNeilly for breaking the Official Secrets Act. Bryson thinks this is part of a tactic to discredit him. “It is easier to discredit him. If they charge him it suggests his comments ring true,” he said. “Particularly surrounding the MoD, they rely on a ‘dark arts’ attitude, the less the public know, the better,” he said. Bryson said it was important to make sure the story did not leave the public consciousness. He also appreciated the political context of the allegations, particularly given the rise in Scotland of the Scottish Nationalist Party (SNP) with their anti-nuclear stance. Since the McNeilly allegations came to light, the Royal Navy has maintained it places the highest priority on security and safety. “The Royal Navy disagrees with McNeilly’s subjective and unsubstantiated personal views but we take the operation of our submarines and the safety of our personnel extremely seriously and so continue to fully investigate the circumstances of this issue,” a spokesperson for the Royal Navy said.